Enjoy total control of your money anywhere in the world! Spend online without any hassle, without using cash or physical cards! Now, you can use WING anywhere in the world to buy and pay online via prepaid Mastercard. Important business transaction? All out shopping spree? Online Mastercard has you covered. Experience only the best and safest online transaction with Wing. Just follow these easy steps and immediately start shopping online with your Wing Online Mastercard. Get your Wing account from any of the 6,000 agents nationwide or instantly register online using the Wing Money App. In the Wing Money App, click Online Card and follow the simple registration steps. Cash in money and start shopping! What sets Wing Online Mastercard apart? Get your Wing Online Mastercard now! Your Wing account is connected to your Wing Online Mastercard. Deposit money into your Wing account to automatically cash in to your Online Mastercard and start enjoying perks of your Wing Online Mastercard. Get the receipt from Wing Cash Xpress and verify the amount, and then you’re good to go! Cash in money to your Online Mastercard via peer-to-peer transfer of Wing. To know how to use Wing-2-Wing, click below. If you have an account with FTB, you can transfer money from your bank account to your Wing wallet. Now that your Wing Online Mastercard is up and running, enjoy a hassle-free and fun-filled shopping experience. Connect your Wing Online Mastercard to your apps on Android and iOS for your in-app purchases. How to connect Wing to Android Play Store? 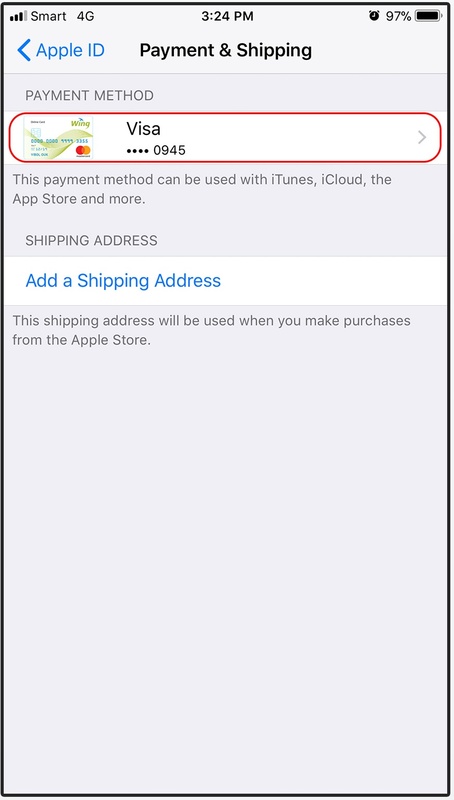 How to set up Apple Pay with Wing Online Mastercard? Have smooth and easier shopping experience on Facebook with your Wing Online Mastercard. Your Wing Online Mastercard is accepted worldwide at over 33 million merchants online! Business transactions have never been this easy. Be in full control with Wing Online Mastercard. Get paid by Freelancer.com, Upwork.com, and other freelancing websites through your Wing Online Mastercard. No issuance and monthly fee in your first 6 months of registration..
(**) FREE monthly fee for the first 6 months. After, it will be charged on monthly basis of USD0.25 for Basic Online Mastercard & USD0.50 for Standard Online Mastercard. No Wing Account yet? Register here. Whether it's for gaming, listening to music or shopping, enjoy quick payment method with Wing. Whether it is for gaming, listening to music or shopping , enjoy a quick payment method with Wing. Tap "Add credit or debit card"
Enter your Wing Online Mastercard number then hit "Save"
Now you can enjoy shopping on the Android Play Store with Wing Online Master Card. PayPal has partnerships with huge online merchants worldwide like eBay and Amazon. Match PayPal's large online payment processing with Wing Online Mastercard's safe and easy spending. Select "Debit or credit card"
The widest range of products is now at your fingertips as you pay with your Wing Online Mastercard at Taobao, China's biggest consumer-to-consumer e-commerce platform. Grow your business with China's most recognized e-commerce giant, Alibaba, and Wing's safe and secure Online Mastercard. Be on top of the mobile payment era with Alipay's quick and convenient online payment processing and Wing Online Mastercard. Paying Facebook ads is now simple and easy with Wing Online Mastercard. Connect your Wing account to Facebook with these steps. Please read these terms and conditions herein carefully before using Online Mastercard of WING, as they shall apply to all transactions involving the use of this card. Agreement means the agreement between Cardholder and WING which includes these terms and conditions. WING, “We” or “us” means Wing (Cambodia) Limited Specialised Bank whose head office is at #721, Preah Monivong Blvd., Sangkat Beung Keng Kang 3, Khan Chamkar Mon, Phnom Penh, Kingdom of Cambodia. Online MasterCard/ Card means a virtual debit card from a payments system by Mastercard issued and used as a means of payment presented in a particular currency in a form of a card. This card exists online or in the internet/digital and no actual plastic card is issued. Card Purchase means any transaction whereby the Card is used as payment for goods and/or services at online Merchant(s). Customer Due Diligence means personal documentation supplied by Cardholder to WING to confirm your name, profile information and current address in order to meet our regulatory requirements. Merchant means an online supplier of goods and/or services which has agreed to accept the Card as payment for goods and/or services. Cardholder/You/Your means the subscriber of WING Payment Services. Agent Wing Cash Xpress who is responsible for providing all Wing services to Wing’s customers such as money transfer, phone top up, bill payment, opening Wing account, deposit (cash in), withdrawal (cash out) and other Wing products and services. Authentication data unique Cardholder’s name (login), password and PIN-code used to access the Service from the Internet and/or through the Terminal and carry out any operations within Cardholder account balance. Authentication data shall be given to a cardholder at the moment of a cardholder’s registration in the Service; at that Service Operator shall be entitled, as provided for therein, to enforce the change of the password and/or PIN-code by prompt notice to a cardholder sending to him/her an SMS message to a subscriber number specified by a Cardholder when getting registered in the Service. Subscriber number a telephone number, given to a cardholder by a cellular communication operator at the moment of a cardholder’s connection to the network of a cellular communication operator, definitely identifying a person who entered with such cellular communication operator into mobile communication service contract. Self-service automaton (SSA) a kind of terminal providing payments receipt from natural persons in self-service mode. Payment System Payment system is referred to system of Mastercard Worldwide or other entities provide license to issue and accept the payment card. Cardholder membership Any person to whom an online card is issued by WING including any renewal and replacement. 2.1 The subject of the Contract made by you by accession to this Offer by doing contracting bargains provided for with this Offer shall be providing of services by “WING” to “You” on the Use of Service with the purpose to make settlements by a Cardholder in favor of Recipients of Payment. 2.2 With the purpose of duly providing by WING of services under the Agreement subject to making thereof on the terms of this Offer, a Cardholder shall undertake to register cardholder account prior to the WING fulfills its liabilities under paragraph 2.1. Therein, in the order provided for with Section 3 therein, and increase the cardholder account Balance to the amount at his/her discretion. 3.1 The use of the Card is subject to terms of this Agreement as may be varied by us from time to time. The current version of the terms and conditions is available on the Website. Usage of the Card constitutes your acceptance of these terms and conditions. 3.2 To apply for your Card you must be at least 16 years old and living in Cambodia. 3.3 We will require a name, date of birth, national ID/ passport #, mobile phone number, link Wing account, and email address when applying for a Card. 3.4 You may also be asked to submit documentation to us for purposes of identification in accordance with our Customer Due Diligence requirements. We may also use electronic methods to satisfy our Customer Due Diligence requirements. 3.5 You will receive your Card once payment approval has been completed. Details will be sent to you online and by a text message to the mobile phone number you provide (subject to successful identity verification) and/or notification pop up through web or App. Please refer to the Website for all Card loading options. c. as soon as SMS message is received by the cardholder containing all Authentication data enter this data in the registration form. d. Follow the step guide in App and complete information as require << Online Mastercard >>. b. enter your mobile phone number given in international format in the registration form; the mobile phone number specified by the Cardholder during sign up will be used as login (Cardholder name) when using the Payment Service. c. as soon as SMS message is received with all Authentication data, enter the data in the registration form. Please note that to get the Card you are required to have Wing Account. 4.1 The Card may only be used in Merchant(s) websites accepting Mastercard. Merchant(s) may change from time to time. 4.2 You shall be responsible for ensuring the correctness and accuracy of all purchases made with the Card. 4.3 We will immediately debit the amount of all Card Purchases from the balance of your Card. If you attempt to spend more than the Card balance using only the Card, your transaction will be declined. as payment for any illegal purchase. 4.5 You cannot stop a Card Purchase after it has been authorized. 4.6 We will not issue Card statements. You can obtain your Card balance or obtain information about previous Card Purchases by logging into WING account and check for transaction or by calling to Customer Service through 023 9999 89. You are responsible for monitoring your Card balance and for ensuring that there are sufficient funds on the Card at all times to pay for Card Purchases. The up to date Card balance and any recent Card transactions will be available to view the same day. 4.7 If at any time you become aware of an unauthorized debit transaction made using your Card you must notify WING immediately by calling to our Customer Service 023 9999 89 without undue delay and, in any event, within 30days of the debit date of the transaction. 4.8 Once you have notified us of an alleged unauthorized or incorrectly executed transaction on your Card, we will promptly investigate your claim. In some cases we may ask you to give us further information about the transaction (for instance, to enable us to confirm that the transaction was properly authenticated). You confirm that you will cooperate with the police or other enforcement bodies if requested to do so. 4.9 Where it is established to our reasonable satisfaction that the transaction was not authorized by you, we will (subject to Clause 4.10 and 4.12 below) refund the full amount of the transaction. 4.10 We reserve the right to refuse a refund under Clause 4.9 where you fail to notify us within 30days of the date of the debit transaction. 4.11 We reserve the right to debit from your Card the amount of any refunds paid to you where, upon further investigation, it is subsequently established that you are not entitled to a refund. If there is insufficient balance on the Card to debit the amount of any refunds paid to you in circumstances where you are not entitled to a refund, we reserve the right to take all reasonable steps (including legal proceedings) to recover from you the amount of any such refunds together with any fees, charges or expenses that we have incurred. 4.12 We reserve the right to withhold refunds if, and to the extent that, we can show you have failed to comply with any relevant provisions of this Agreement. 4.13 WING will not be liable for defects in any goods or services paid for using the Card. Any queries or complaints about such goods or services should be addressed to the relevant Merchant(s). 4.14 In case of termination of the agreement to render mobile communication services concluded between the Cardholder and the mobile network operator followed by annulment of the mobile phone manager specified by the cardholder when signing the Cardholder Account in the Service, the Cardholder is obliged to cease using services of the system based on Authentication data that include the above said mobile phone number and terminate the agreement concluded by the Cardholder by accepting this Offer through making licensed transactions provided by this Offer. 4.15 Prior to the date when the Cardholder submits the new mobile phone number to the WING either prior to receipt of the written notification from the Cardholder on the agreement termination, WING is entitled to disable access to services for the Cardholder based on application of Authentication data that include the annulled mobile phone number. 4.16 The rights to funds on the balance of the Cardholder Account are confirmed by submission of the corresponding letter by the Cardholder with the copy of the agreement concluded between the Cardholder and mobile network operator certified by the WING attached to provide mobile network services that allow the Cardholder the privilege to use the mobile phone number specified by the Cardholder when signing to the system, and copy of the passport or any other document to acknowledge the Cardholder’s identity. 4.17 In case when the Cardholder fails to submit documents specified in the clause 4.16 of this offer within Thirty (30) calendar days since the date of the corresponding notification sent to WING, the letter is entitled to terminate the Agreement concluded on terms of this Offer in this sole discretion. 4.18 Any Online Mastercard transaction amount presented to WING for authorization or for payment is subject to be debited from the account but it is not a settled amount for the transaction unless it is same as amount billed from Payment System. WING will extra debit or credit certain amount from or to your Wing account regarding to any transaction amount which is unbalance between authorization amount and billed amount from Payment System for transaction settlement. WING may credit any debited amount for unsuccessful transaction which is not billed to customer’s Online Mastercard account for payment after 30 (fifty) calendar days from the transaction date. In addition, WING might reduce the amount of credit time from 30 (fifty) calendar days to 15 (fifteen) calendar days if WING receives a written request from cardholder, confirming that the transaction is incompletely performed. However, cardholder is still liable for any and all unsuccessful transaction if it is posted to WING afterwards for settlement. 5.1 You have a legal right to cancel your Card up by notifying to WING. 5.2 If you cancel your Card for whatever reason, we will immediately block your Card so it cannot be used. You will not be entitled to a refund of money you have already spent on transactions, or pending transactions or any fees due for the use of the Card before the Card is cancelled. 5.3 You can cancel your Card by contacting our customer service through 023 9999 89 or deactivating it on your Wing App. You are in breach of any of the terms of this Agreement; or we have reasonable grounds to suspect fraud, theft or dishonesty; we will be entitled to take such steps as we consider reasonably necessary to restrict your right to use the Card, which, without limitation, shall include, without prior notice to you, refusal to authorize a purchase, suspension, withdrawal or cancellation of your Card. 5.5 Your Card number will be valid for 1-2 years based on the type of your Card used. In case the card has expired you can self –issue a card from your Wing App. 6.1 You shall undertake to take any necessary measures as to the safety and protection of information and documents that are exchanged within the Service or that are available to you regarding Use of Service. 6.2 You shall undertake to independently take all necessary measure to keep confidential, prevent any unauthorized use and to protect his/her Authentication data from any unauthorized access by third parties. You shall not inform your Authentication data to any third parties. 6.2.1 With the purpose to prevent from any unauthorized use and to protect own Authentication data from any unauthorized access by third parties using any remote access channels, you shall undertake to independently install on technical devices used by you to access the Service (except terminal type devices, belonging to Agents) an antivirus software and to maintain its timely updating. If non-use by a Cardholder of any antivirus software, use of unlicensed (illegally purchased) antivirus software or late updating of threat signatures result in acquiring by third parties of an unauthorized access to a Cardholder’s Authentication data, WING shall not be responsible for any damage caused to cardholder account (including making of payments at the expense of assets available on the cardholder account Balance) through the Service using a Cardholder’s Authentication data until the WING receives a due notice. Information requires to be disclosed on the grounds stipulated with legislation or suspected treaties or relative requests of count or of authorized state bodies have been received. To prevent any efforts of illegal trade, illegal financial transactions, transactions purposed to legalization (laundering) of income obtained criminally. To present notarized copy of a mobile communication service contract made with cellular communication operator, entitling a Cardholder to use Subscriber number specified by a Cardholder at registration of cardholder account in the Service. 6.6 WING shall undertake to permanently control over the confidentiality of personal details of a Cardholder. WING shall undertake neither make use of nor disclose any information identifying a Cardholder with the purpose not related to the execution and issuance of documents, making requirement or making settlement with a Cardholder. Disclosure of any information may only be in such cases previously notified to a Cardholder at the moment of obtaining of such information from a Cardholder or with a Cardholder’s consent. At that the Service Operator shall be entitled to give other persons an access to information on a Cardholder only if a Cardholder has directly expressed his/her interest in their goods, works or services. 6.7 WING shall be entitled at any time without any additional address notice to a Cardholder, to develop and introduce additional safety measures to Use Service. WING shall place a notice at Website about introduction of such safety measures and actions of Cardholders in connection with introduction of such measure (if applicable). 7.1 In the event that you do not use your Card in accordance with these terms and conditions or we find that you are using the Card fraudulently, we reserve the right to charge you for any reasonable costs that we incur in taking action to stop you using this Card and to recover any monies owed as a result of your activities. 7.2 Like other payment cards, we cannot guarantee a retailer will accept your Card, or that we will necessarily authorize any particular transaction. This may be because of a systems problem, something outside our reasonable control, or because we are concerned that your Card is being misused. Accordingly, we shall not be liable in any event that a merchant refuse to accept your payment or if we do not authorize a transaction, or if we cancel or suspend use of your Card. 7.3 Unless otherwise required by law, we shall not be liable for any direct or indirect loss or damage you may suffer as a result of your total or partial use or inability to use your Card, or the use of your Card by any third party. 7.4 We may restrict or refuse to authorize any use of Your Card in any legal jurisdiction if using the Card is causing or could cause a breach of the Terms and Conditions of this agreement or if we suspect criminal or fraudulent use of the card. 7.5 You must immediately notify WING of the lost, stolen, theft and/or unauthorized use of the Online Mastercard account by verbal or in writing. You may be liable for any and all unauthorized transactions but you shall have no responsibility for any unauthorized use that occur after you notify WING, orally or in writing, of the lost, stolen, theft and/or other possible unauthorized use of your Online Mastercard. 8.1 We may add to or charge these terms and conditions in accordance with clause 8.2. We may add new fees and charges or change existing fees and charges at any time. 8.2 We will tell you in advance if we add to or change these terms and conditions or if we add new fees or charges or change existing ones. The amount and type of notice that we will give you will follow the laws and regulations that apply at that time. (For example, we may notify you by letter, electronic mail, telephone (including recorded message) or by an advertisement in WING website and Facebook). 8.3 If we change or add to these terms and conditions and you are not happy to accept the changes, you may end this Agreement and close your Card. If you do not ask us to end this Agreement, you are deemed to accept the changes on their effective date. A non-refundable card annual fee or card replacement fee (refer to Card Services and Fee Charges) as prescribed by WING from time to time shall be debited from cardholder’s Wing account for the use of the Online Mastercard. Cardholder shall be charged a fee (refer to Card Services and Fee Charges) if any transaction performed by customer is declined due to unavailable balance in the Wing account. If cardholder requests WING to process any dispute transaction, a fee charge per transaction will be incurred and debited from the Wing account. However, WING shall inform you initially about additional fees and other charges which are not listed in Card Services and Fee Charges before proceeding with the case. FX Fee of 2.5% of volume transaction is charged to Cardholder when cardholder purchase goods or service in other than US Dollar currency. (For the update please refer to Card Services and Fee charges). 10.1 WING will not be liable for any delay or failure in performing any its obligations in respect of the use of the Card where such delay or failure occurs because of any circumstances beyond WING reasonable control. 10.2 The accounts and records kept by WING or on its behalf shall, in the absence of an obvious error, constitute sufficient evidence of any facts or events relied upon by WING in connection with any Card Purchase or matter or dealing in relation to the Card. 10.3 WING may disclose details of the Card to any person acting as its agent in connection with the use or issue of the Card. 10.4 This Agreement shall be governed by and interpreted in accordance with Cambodia Law. 10.5 In case of a language discrepancy between English and Khmer, the English language Terms and Conditions shall prevail. Online Mastercard is issued by Wing and Wing is the data controller. The personal information which you have provided to us may be used in the manner set out in the Clause 13. This information will be used by WING so that we may carry out statistical research and analysis, compliance and regulatory reporting and administration in respect of the Card in accordance with the above. The Customer grants WING and relevant third parties a perpetual, royalty free right to keep a record of the information referred to above. If you want to receive details of those fraud prevention agencies from whom we obtain, and with whom we may record, information about you, please write to us at the address show in Clause 11.3 below. You have a legal right to these details. 12.1 It will be necessary in all cases, for a Merchant(s) to obtain authorization to honour the Purchase; this is to ensure that there are sufficient funds on the Card. We may refuse to authorize a purchase at any time if there are insufficient funds on the Card. 12.2 A Merchant may not be able to obtain authorization from us in some circumstances. If this happens we will not be responsible if you are unable to use the Card for a particular Purchase. Furthermore, we will not be liable for the refusal of any Participating Retailer to accept or honour the Card for any reason. 12.3 If a Merchant becomes liable to make a refund to you we will not credit the amount of any refund to the Card; refunds are a matter between you and the relevant Merchant. 13.1 If you have an enquiry relating to your Card, you can use the “Contact Us” facility on the Website. We will deal with your enquiry promptly. 13.2 If you do not wish to enquire in this way you can alternatively call our customer service through 023 9999 89. WING shall not be responsible for those goods and services supplied by any merchant or establishment in respect of any transaction performed by cardholder. Also, WING shall not be liable in any way if any merchant or entity refuses to accept or honor the Online Mastercard for any reason. However, WING may defend and counterclaim (other than tort claims) arising out of the transaction of customer if you have made a good faith attempt but have been unable to obtain satisfaction or solution from those merchant or establishment. In case of any wrong posted or fraud transactions somehow related to this card, WING will support Cardholder to return the claim of transaction amount by initiating chargeback request to acquirer through respective payment system (Mastercard). But in case of this chargeback dispute will be lost based on respective payment system’s rules, WING is not responsible to return any lost amount, Cardholder will absorb the losses. WING makes no claims or warranties with respect to the equipment or the system and WING shall not be liable for any failure to provide any service or to perform any obligation due to any malfunction of the equipment, the machine, the system or the Online Mastercard, failure of communication lines or any other circumstances beyond the control of WING. If you are not satisfied with any aspect of the service offered, please contact our Customer Services on 023 9999 89, via the “Contact Us” link at our Website or write to Customer Services at WING Head office. They will be pleased to help and explain the complaints procedure in more detail. A copy of the Complaints Procedure is available upon request. WING will try and resolve your complaint as soon as possible. Often however, the compliant will need to be investigated. If this is the case, WING will respond to your within five (5) Business Days to acknowledge receipt of your complaint and tell you how long it might be before your complaint is resolved. Q1. What's Wing - Online Card? And what's its benefit? Q2. How can I get a Wing - Online Card? A2. Firstly, you need to have Wing account. Then, you can download Wing Money App and register for virtual Online Card for just a minute. Q3. What type of cards are available? A3. There are two types of online card right now, Basic and Standard. Q4. What's issuance & maintenance fee of Wing - Online Card? A4. Issuance fee of Wing - Online Card is FREE. Monthly annual fee (USD0.25) for Basic, (USD0.50) for Standard, FREE for the first 6 months of activation. Q5. Can I create online card with my Cardless account? Q6. Can I create online card with my Cellcard Reward account? Q7. What is the limit amount per transaction for the Basic and​ Standard package of online card? A7. Max. $100 per txn and per day for Basic and Max. $1,000 per txn and per day for Standard package. Q8. What is the maximum transaction per day for Basic and Standard package? A8. There is no limitation on transaction, there is limitation on amount spending per day. Q9. Why do I need to input email /phone number during online card registration when all my detail information are already in Wing Account? A9. This phone number or e-mail dress is used for any dispute case for any online purchase transaction. Q10. How do I check my online card transaction? A10. There is transaction tab on online card screen which lists down all transactions related to your online purchase through virtual account. But transactions are available only last 3 months. Q11. Can I change my CVV number as I feel someone has known it? How could I secure my account? A11. You cannot change CVV code right now. Q12. How to purchase item via Wing - Online Mastercard? A12. The process of online purchase with virtual card is actually the same to other online transaction using physical Mastercard. User can input card number (16 digits), card expiry date, CVV code, 3D Secure (If required) on Wing virtual card. Q13. Can I top up my online card with VISA/Master corporate ATM/partners (both local/abroad)? If yes, How much does it cost? A13. You can't perform money in or out from your virtual account. It's used for online purchase transaction purpose only. Q14. Can I withdraw money from my Online Card through VISA/Master corporate ATM/partners (both local/abroad)? If yes, How much does it cost? A14. You cannot withdrawal money from your virtual account right now. Q15. Is there any hidden fee for customer? A15. No, all fee charges are disclosed on Wing's website. Q16. Is Wing - Online Card accepted globally? A16. Yes, Wing - Online Card is accepted around the world at retail outlets where you see the Mastercard sign. Currently, you can use your card in more than 32 million locations worldwide. Q17. Who should I call if I have problems with my Wing - Online Card? A17. If you experience problems with your Online Card either domestically or abroad, you should contact our Wing Care Centre by 023 999 989. Q18. What should I do if I have lost or had my Online Card stolen? A18. If your card is lost or stolen, you should contact our Wing Care Centre by 023 999 989 immediately. As a precaution, we suggest that you keep a note of this number separate from your cards/wallet. Q19. What is difference between normal Wing card and Wing - Online Card? A19. Normal wing account card is used for local transactions only whereas Wing - Online Card accepted domestically or oversea usage, specifically for online transaction. Q20. How is currency conversion charged to my account? A20. When you transact any online purchase with non-USD currency, you need to bear 2.5% of currency conversion of total volume. Q21. I made a purchase in my local currency, so why was I charged a currency conversion fee? A21. Wing - Online Card is applicable for USD dollar currency only. So if your Wing account wallet is KHR and you do any online transaction via virtual card, you will be subject to bear 2.5% of currency conversion. Q22. What is the currency rate for a country I am visiting? A22. If you would like to know what the latest currency exchange rate is for the country you are visiting, please visit Mastercard's website for the latest currency exchange rates (https://www.mastercard.us/en-us/consumers/get-support/convert-currency.html). Q23. How can I report an excessive charge for currency conversion? A23. Thank you for your feedback and we’re sorry you had a bad experience at a merchant that accepts Mastercard. Wing & Mastercard investigate all complaints of deceptive merchant practices. Should you wish to speak with someone directly regarding this communication, feel free to contact Wing Care Center by 023 999 989. Q24. How do I contact Mastercard Customer Operations Support? A24. You can contact Wing Care Center by 023 999 989 for any inquiry related to Wing - Online Card. Q25. How can I dispute a charge? A25. If you face any dispute case of transaction on Wing - Online Card, Wing will coordinate this directly with other parties for you but you are required to report all related matters if existed. Q26. Who do I contact if I never received an item that I purchased online or by phone? A26. If you did not receive an item that you purchased or if you received an incorrect item, you should first contact the merchant to try to resolve the situation. If you can't come to an agreement and you want to dispute the transaction, Wing can help you on this case. Please feel free to reach us by 023 999 989 for detail. Q27. Why is my purchase declined? There is insufficient funds in your Wing account that is linked to the Wing - Online Card. You will need to do cash-in to your Wing wallet. Your purchase amount exceeds your chosen daily spending limit. Your Wing - Online Card expired. Q28. If I want to stop using Wing - Online Card, what should I do? A28. You can deactivate Wing - Online Card by yourself on the App by just going to Deactivate Card option. Q29. How do I reload balance to my Wing - Online Card? A29. Wing - Online Card is direct debit from your Wing account (source of fund) so no need to do reload to your virtual account. Every time, you do only online transaction system will deduct from your Wing account directly. Q30. Can I transfer balance from my Wing - Online Card to another bank's Mastercard/Visa? A30. You can not transfer money from your Wing - Online Card to others right now. Q31. What's happened if I cancel my successful transaction which I don't want? A31. The transaction will be cancelled but you are charged USD0.4 per transaction.